Afghanistan is a site of travel that has long been mythologised by the British. Travel writing has been central to this process. Sub-genres of British travel writing about Afghanistan reflect the histories of colonial contact with Afghanistan. Mountstuart Elphinstone’s 1815 An Account of the Kingdom of Caubul is a pillar of the British tradition. In keeping with the style of the day, his account is primarily written in the informational, ethnographic mode. Elphinstone led an 1808 British Mission to Afghanistan to Shah Shujah, the beleaguered King, with the purpose of drawing up a treaty to quieten British colonial fears of any alliance forming between Afghanistan and Napoleon, possibly leading to an invasion of British India from the North. The mission failed, and the unpopular Shah Shujar was chased out of the country by his own people, only to be later reinstated by the British during the notorious First Anglo-Afghan War (1839-42). A military sub-genre emerged during the First Anglo-Afghan War, signalling a traumatic moment of Anglo-Afghan contact which has shaped – thematically and ideologically – all subsequent accounts. As travel writers and journalists never tire of saying, the war ended with the massacre (or, more probably, death from exposure) of thousands of British troops, families and their servants on the retreat from Kabul. This was most famously related by Lady Florentia Sale’s popular Journal of the Anglo-Afghan War and by Vincent Eyre’s The Military Operations at Kabul (1843). No travel account is silent about the First Anglo-Afghan War, which – via colonial histories, travel accounts and Rudyard Kipling – continues to set the discursive agenda for contemporary travellers and journalists. The psychological impact of the First Anglo-Afghan War on British imaginations cannot be underestimated. It is from this historical moment that Afghans began – and continue – to be depicted as medieval, murderous, warlike and unruly. 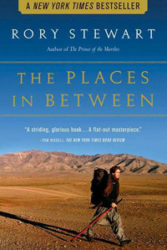 In 2004, Rory Stewart’s The Places In Between made its bold entrance into the theatre of established travel accounts of Afghanistan. Stewart was the beneficiary of widespread media coverage of his book, partly because he was well-connected, but also because he was by all accounts the first European civilian to journey through Afghanistan’s post-war landscape during the War On Terror. In their articles about Stewart’s on foot travels through the country’s battle-scarred landscape, journalists frequently depicted him as an eccentric yet brave traveller. After The Places In Between was contracted (but before its publication), an article from The Observer depicted Stewart as ‘fearlessly’ following in the footsteps of a Moghul emperor through ‘post-Taliban’ terrain (as journalists then believed Afghanistan to be) (4 December 2002). It is of course true that Stewart’s narrative belongs to a sub-genre of in-the-footsteps travel narratives about Afghanistan and, as such, has a profound sense of belatedness. Stewart’s journey comes after so many others and requires all the research and intertextual references that such an endeavour implies. The narrative is ever-conscious of the walk’s relation to earlier journeys: ‘After lunch we walked on’, Stewart writes. ‘At the outskirts of town, we passed one of the traditional junctions for the Silk Road, where the caravan route turned north to China or south to India’ (p. 29). At the same time, The Places In Between calls this historical sense of his journey into question by openly recognising the very modern conditions that made his book so appealing in the first place. Stewart’s self-reflexive narrative is very knowing of the fact that his trek through Afghanistan comes not so much after the emperor Babur as after international media coverage of Operation Enduring Freedom, the first phase of the War on Terror. Counterbalancing the journey’s historical purview, then, is a strong consciousness in Stewart’s narrative of the inescapable present-day military and ideological contexts. His on-foot journey is interrupted at one point by an LA Times reporter who ‘clattered up and stopped beside’ him (p. 148). Two travellers, each journeying at distinct speeds with apparently dissimilar purposes in mind find that their paths unexpectedly converge. Each appears in the other’s writing as though in acknowledgement of some kinship – albeit mutually suspicious – of genre and purpose. Yet Stewart’s dramatisation of this encounter between genres is somehow prophetic, since ongoing war in Afghanistan has meant that war correspondents are increasingly likely to be the figures to produce travel writing about the country. Yet the journalist’s clattering jeep is intended as a critique of journalists’ account of Afghanistan: their rushed glances at the country and their problematic framings of their subjects. The journalist’s question to Stewart focuses on the danger of his journey. Stewart’s response is to show how travel writing expands confined journalistic spaces, answering: ‘Surely you can understand’, I said, ‘the stillness of that man Qasim. The Prussian blue sky – this air’ (p.30). But the journalist does not understand: ‘But he wrote none of this down’ (p. 30). Stewart’s travel account thus sets out to reinsert that which news professionals deem unnewsworthy. The result is a rich, evocative narrative full of the compassion and identification with Afghans that is so lacking in earlier narratives. Stewart’s discursive agenda is set, in many ways, by the history of British ideas about Afghanistan. Yet it negotiates these, sometimes even quoting earlier accounts in ways that expose repeated and surprisingly uniform claims about the Afghan people. By attending critically to established ways of representing Afghanistan, he urges the reader to be sceptical. In place of the war correspondent’s scant glance over the country, too, Stewart often allocates textual space to the details of particular Afghan lives. In the manner of postmodern travel accounts, too, he parodies his own journey. At one point a villager compares Stewart to a twelfth-century traveller: ‘I was thinking about you last night, Rory. You are like a medieval walking dervish’ (p. 218). In a country besieged by modern warfare whose ruined infrastructure has persistently been misrecognised as medieval from Eric Newby’s 1950s A Short Walk in the Hindu Kush to modern-day reporting, such reversals are a remarkable achievement.